The Wolter Family: (L to R) Gary Wolter, Mari Wolter, Luella Polfer, Ben Wolter, Catherine Hennessey Wolter, and Mike Wolter. Mari and Gary Wolter received the 2014 United Way of Dane County Tocqueville Society Award in honor of their service and philanthropic leadership in Dane County. 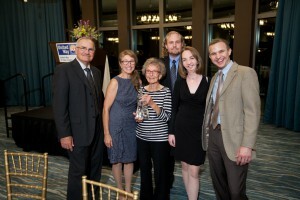 Mari and Gary Wolter received the 2014 United Way of Dane County Tocqueville Society Award at the Society’s annual membership reception on September 11. The event, held at The Edgewater Hotel, was underwritten by Johnson Bank and Baker Tilly. The Tocqueville Society Award celebrates and acknowledges those who have made a major impact on the quality of life in Dane County through exceptional service and commitment. Mari and Gary Wolter moved to Madison in 1984. In that year Gary became a staff attorney, his first of many positions with Madison Gas & Electric Company, before becoming President and CEO. Gary became active in the Orchard Ridge Neighborhood Association, eventually becoming president in 1987, and Mari took leadership of the Parent Teacher Student Organization at Memorial High School, helping to recognize and support the efforts of our educators. In addition to Mari’s passion for education, she’s a strong advocate for the environment. Specifically, over the past few years, Mari has devoted countless hours of labor toward encouraging native ecosystems to rebuild themselves, including extensive efforts to restore prairie lands in her hometown in Iowa. She has used these efforts as a way to reach out to the surrounding community. What began as a few class projects in connection with the University of Dubuque has turned into a network of projects and ranks of affiliated students who travel to the unique environmental space Mari has enabled to flourish to study everything from flying squirrels, bats and snakes to invasive plant species. Over the years Gary has been heavily involved in leadership roles with United Way of Dane County. He joined the Board of Directors in 2004 and chaired the campaign in 2006. In 2012, he served as Chair of United Way’s Board of Directors. Gary’s service to our community in education, safety and health has also benefited Edgewood High School, where he served as trustee, the Madison Community Foundation, and Meriter Hospital, where he also served as a director. As a Director and past Chair of the Madison Region Economic Partnership (MadREP), Gary devotes part of his time to building a long-term strategy for economic expansion, therefore aiding in the creation of more jobs for the area’s 600,000 residents. Also, in a similar role as a Director and past Chair of the Greater Madison Chamber of Commerce, he helps steer the organizations toward success in supporting and cultivating local businesses. Gary’s work includes a brief stint in government service. In 2008, the Governor asked him to lead the startup of the Wisconsin Office of Recovery and Reinvestment. While there, he led the transparency and accountability efforts for the money coming to Wisconsin under the American Recovery and Reinvestment Act. These achievements have earned Gary recognition in multiple publications and organizations, including In Business Magazine, Madison Magazine, the Madison Chapter of Sales and Marketing Executives, and the South Central Wisconsin Workforce Development Board. To learn more about leadership giving opportunities and United Way Tocqueville Society contact Marlene Vadjunec at mvadjunec@uwdc.org or (608) 246- 5480. The United Way Tocqueville Society acknowledges exemplary leadership in philanthropy. The Society is named for Alexis de Tocqueville, the French citizen who traveled the United States and wrote about his observations of the American spirit of community in Democracy in America, published in 1835. Society members are among the United Way movement’s most outstanding and engaged partners. On a national level, Tocqueville Society members collectively give more than one half billion dollars to United Way each year, helping local United Ways advance the common good. Our Dane County Tocqueville Society began with the visionary leadership of Oscar G. Mayer and Jerry M. Hiegel. The original membership included six families who contributed more than $60,000 in 1990. This year, the Society exceeds 215 members who together invest greater than $3.7 million in United Way to positively impact people’s lives. The leadership, service and gifts of Tocqueville Society members are at the heart of United Way of Dane County’s work in our community. To learn more, visit www.unitedwaydanecounty.org/tocqueville-society. There is a reduction in violence toward families and individuals. United Way engages our community, mobilizes volunteers and strengthens local nonprofits to achieve measurable results and change lives.